Buried in debt and see no way out? Gudeman and Associates will get you through this. Something happened: you got sick, you lost your job and income, you got served papers for what turned out to be an ugly divorce – something that pulled the rug out from under you. Yes. Bankruptcy can solve financial problems. I just want to tell you, life is not over. I want you to call the same law firm that’s been helping a lot of my listeners set up their estate plans: Gudeman and Associates. Tired of the worry? The harassing phone calls? The robbing Peter to pay Paul? Call Gudeman and Associates and all that can stop tonight. 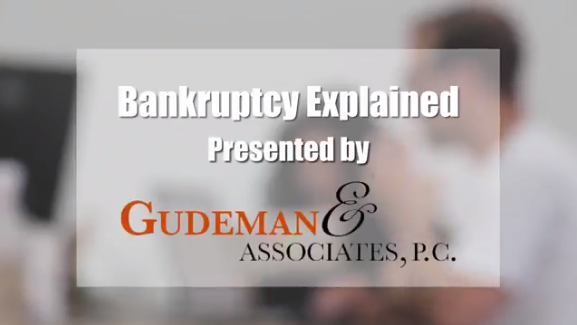 Bankruptcy is the way the law allows you to repay some of your debt, all of your debt, or in some cases not have to repay any debt, so you can get on a path to a fresh start. So call Gudeman and Associates today. They’ll be able to explain what your options are in a free, no obligation consultation. Either call them at 248-546-2800, or just use the form on this page. Gudeman and Associates will get your through this…I promise. It’s easy to feel hopeless in the face of overwhelming debt. The team at Gudeman & Associates, P.C. wants you to know that you have options. Many people are apprehensive when it comes to considering bankruptcy, but it is important to remember that it is nothing to be ashamed of. Bankruptcy is merely a tool – not a status symbol, and using it properly is a smart decision. Our clients receive valued counsel from a knowledgeable lawyer in matters pertaining to debt relief and foreclosure defense.